As a kid, one of my favorite dreams was gliding through the sea as a mermaid. My hair would trail behind me while my new fins would propel me forward racing against a school of fish, dolphins, and sea horses. Swimming in the ocean and existing among the coral reefs, looking at the vibrant colors of a rarely seen world, and forever basking in the blue glow of the sea…Sounds kinds of awesome doesn’t it? 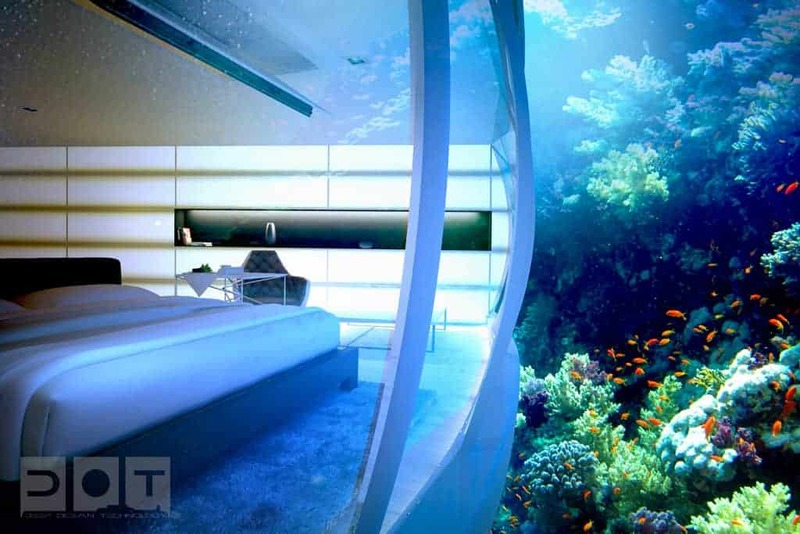 Now, you can get pretty close to an “under the sea” lifestyle with underwater resorts popping up all over the world. In Key Largo, FL you will find Jules’ Undersea Lodge, one of the few underwater hotels in actual existence. Originally, it was the La Chalupa Research Laboratory used to study the continental shelf off the coast of Puerto Rico. It has now been converted into an underwater lodge accessible only by scuba diving down 21 feet! You enter the lodge through a entrance in the bottom of the habitat and climb into a little underwater cottage that sits in the mangrove lagoon. Beautiful fish such as angelfish, parrot-fish, and barracudas serenely swim by the windows of the lodge while marine life covers every inch of the outside walls of the habitat. You can even scuba dive around the lodge and explore the surrounding lagoon and the creatures that call it home. If you aren’t a certified diver, you can be trained onsite and rent all the needed equipment. (Image via Jules’ Undersea Lodge)For you and a guest an evening in the lodge is $800. It includes a pizza delivery from Papa John’s and breakfast. The lodge is also filled with drinks and snacks in case you have a midnight craving. 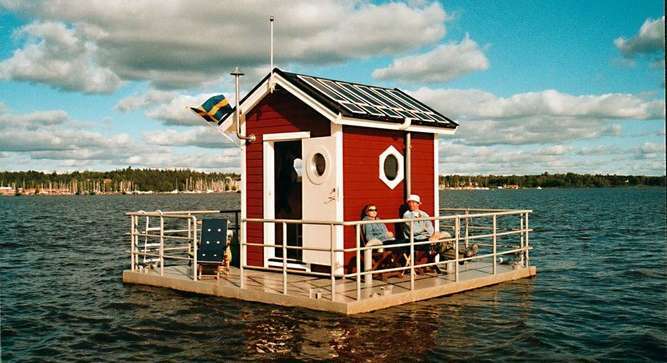 On Lake Malaren in Sweden, guests can visit the charming red house of The Utter Inn (pronounced Otter in English). This quaint little cabin was designed by Mikael Genberg as an art project. (image via The Utter Inn)An inflatable boat brings guests to the island and drops them off for a vacation of seclusion. Guests can swim and sunbathe or take an inflatable canoe ride to the nearest uninhabited island for a little exploration. A small ladder connects the upstairs to the downstairs where there are two beds with sparse and simple design. 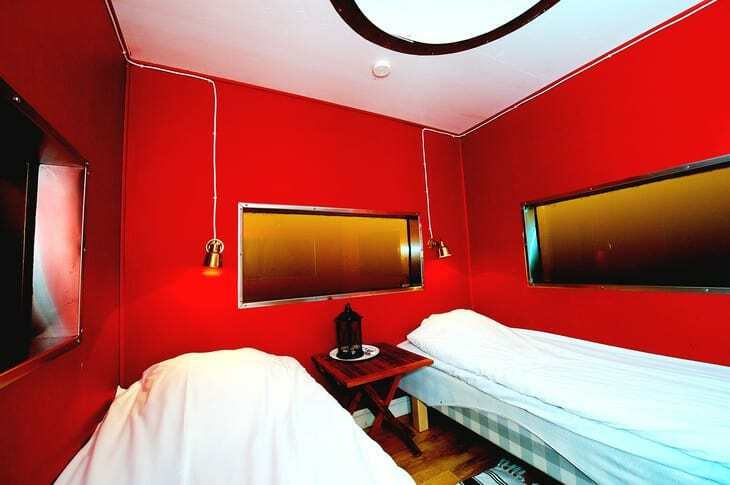 Windows in the sleeping quarters below give you a full view of the lake life passing by. If preferred, guests can have dinner delivered by boat in the evenings. It is the perfect place to take a vacation and literally escape the rest of the world. For seven nights of seclusion on your own island rates start at $1,750.00. In the Maldives, there is another spectacular chance to room under the sea at Conrad Maldives Ragali Island. The underwater ITHAA Restaurant is 16 feet below the surface and offers a stunning view of world below the surface of the Indian Ocean. Fish and sharks glide over the glass ceiling of the restaurant and dance in the crystal blue waters. While the restaurant is the only underwater portion of the hotel, you can rent it for the evening, special occasions, and even a wedding! Packages are available for your own private under water ceremony. Say I do surrounded by an ocean of creatures. While these are currently the only three underwater locales that are available for reservations, there are plenty more resorts in the works that will blow you away with there futuristic and whimsical worlds submerged below the depths. Also read: What's in Your Travel Carry On Bag? An underwater hotel originally planned by Berlin architect company Gewers & Pudewill to be built in Dubai, is set to open in 2016 near Hanai, China. (image via Gewers & Pudewill)With 175 rooms and suites above and under the water, Hydropolis will be a floating island of sorts with check-in procedures on land and then a life via water taxis will transport guests to Hydropolis. In Fiji, the Poseidon Underwater Resort will rest below the surface among the home of exotic sea life. 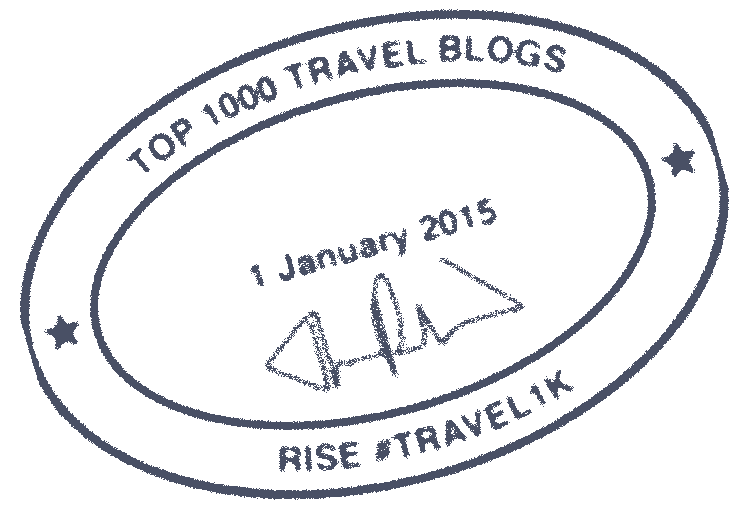 Potential locations are still being scouted, but you can sign up to receive notification as soon as they are accepting reservations. The resort will boast a variety of activities with scuba diving, 1,000 foot luxury submersible to explore the ocean, marine focused spa-treatments, and meditation classes. There will also be a dive shop and a boutique for a little retail therapy. A fitness center complete with tennis courts, a pool, and a 9-hole executive golf course. After taking advantage of all those activities, enjoy some quiet time at the library before visiting the fine dining restaurants. Then, head to the theater for a film and unwind afterward in the lounge. 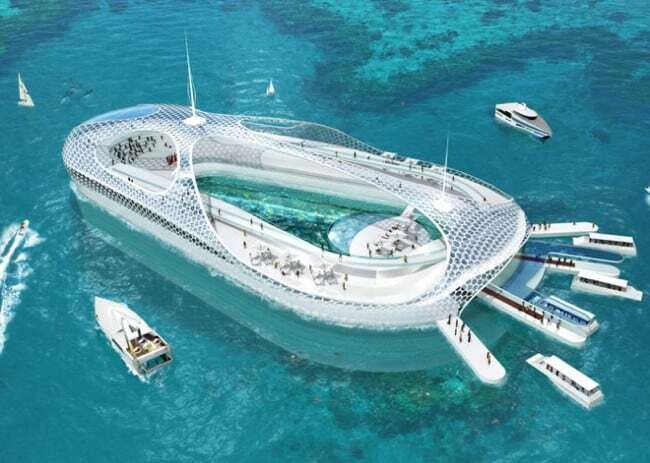 In Dubai, plans for the ultimate, futuristic underwater resort are in the works. The architect Pawel Podwojewski has been working on the Water Discus Hotel design for more than four years, and he has approached the construction as if he were designing a ship. This modern resort will have a land component with a tunnel that connects to the water component. With the under water suites not fixed to the ocean floor, the entire underwater disc will be able to rise to the surface for evacuation or repairs. The suites will sit over 32 feet below the water and feature 21 rooms with enormous wall to ceiling windows to view the sea life surrounding the disc. There will be an underwater diving center and a spa along with a terrace and swimming pool on the upper disc. The under water disc will also be able to rotate constantly changing the view of the rooms. The construction firm Drydocks World will be building the hotel while the technology will be coming from the Polish company Deep Ocean Technology. This incredible undertaking will be the world’s leader in underwater luxury. In the Sonjiang District of Shanghai, there is an abandoned rock quarry that will be the new location for the 19 story resort Shimao Wonderland Intercontinental with the lowest two levels to be submerged below the shadowy depths. 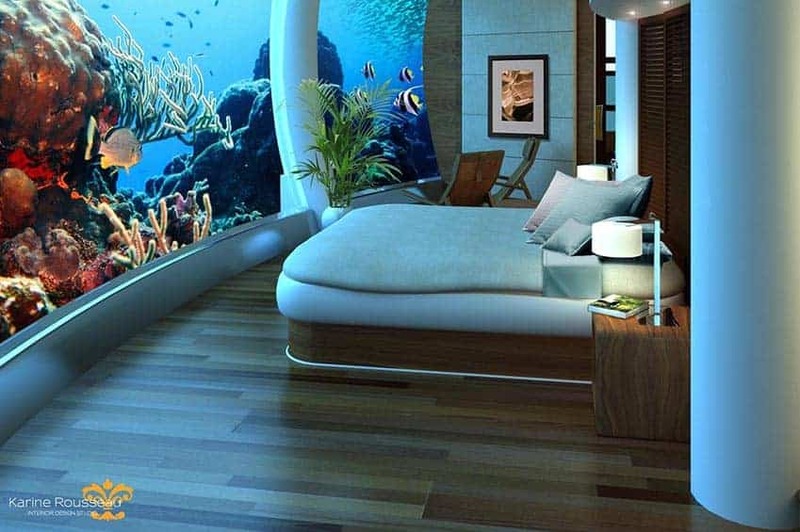 Atkins Global’s design features guest rooms, an aquarium, and underwater restaurant. If sleeping underwater isn’t enough, guests can go bungee jumping and rock climbing. The resort will offer water sports, roof gardens, a waterfall, a sports center, and amenities galore. This incredible hotel will be set in the quarry at the base of the Tianmenshan Mountain. 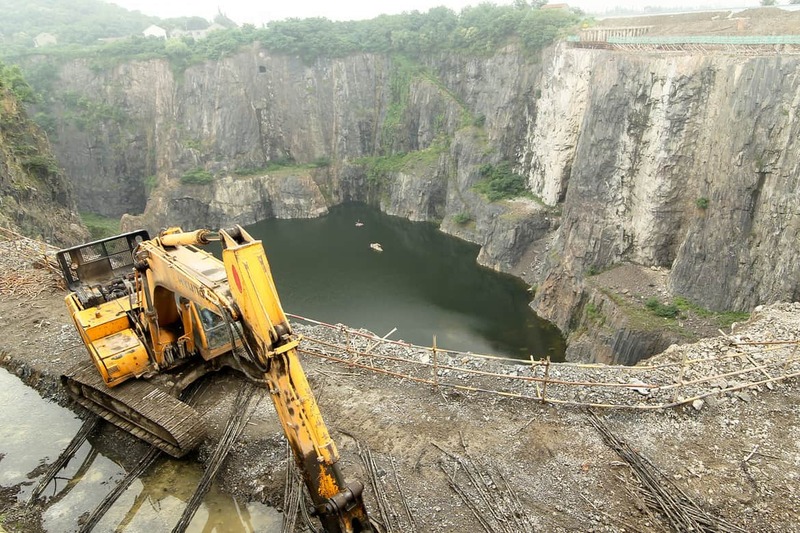 The stunning hotel will be just one component of the breathtaking views surrounding the immense quarry. The hotel is set to open in 2015 with rooms starting at $300 per night. Amazing! Especially the one in Fiji! So cool.